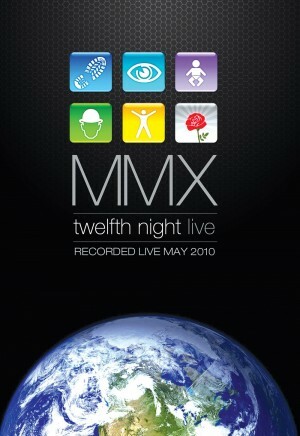 MMX, recorded live during the ‘Play On’ tour dates in May 2010 was our first newly recorded album since 1986. The gig in Wath-upon-Dearne was promoted by the Classic Rock Society, and unusually for ‘TN’ features a 6-piece line-up the reasons for which are explained below. The double DVD showcases all the tracks in high-definition video… over two hours of music with a multitude of extras including an alternative view with a stunning AV presentation, three slideshows, newly recorded interviews with the band, backstage footage, specially written music, extensive sleevenotes, ‘Easter eggs’, and much more! It is also available as a double CD here. In December 2009, just days after the publication of the band’s official biography, Twelfth Night agreed to headline the first night of the Classic Rock Society’s Progeny 3 Festival in Leamington Spa. This led to several other tour dates including a memorable performance at the ‘Night of the Prog’ festival in Loreley, Germany in September 2010. However early in 2010, it became clear that founder-member Andy Revell would be unable to take part this time, so acting quickly, plans were soon in hand to implement a long-standing idea: to expand the band to a six-piece. Core members Brian Devoil, Clive Mitten and Andy Sears were joined once again by Mark Spencer (providing continuity from the 2007-08 concerts), though Mark now took a more prominent role performing bass, lead and rhythm guitar as well as some keyboards. Roy Keyworth and Dean Baker, both members of progressive rock band Galahad (who had been on the same bill as Twelfth Night at Tiana in 2008), were invited to fulfil lead guitar and keyboard duties respectively. The first rehearsal took place in February 2010, with the new, fuller sound immediately clicking into place. With the extra person came the opportunity to completely revise the set list for 2010, Take a Look returned, and Last Song, Theatre, and The Craft (all songs from the XII album) were performed for the first time since 1986. Other changes meant that CRAB, an early piece dating from 1980, was slipped in after Fact and Fiction, and perhaps most significantly, the band’s epic song The Collector returned to the live set for the first time since 1984. This new DVD, recorded at the Wath-upon-Dearne gig, shows the six-piece Twelfth Night at its full power, performing many of their classic songs to an enthusiastic audience. Andrew Wild, Author Play On: The Authorised Biography of Twelfth Night.